We have a lot to be thankful for here at MBODY360, after an amazing year of learning, growth and new insights! This Thanksgiving week, we’re especially grateful for our amazing partner Health Coach Institute (HCI), a world leader in educating, certifying and providing ongoing support and services to health coaches – with over 10,000 coaches trained, and counting. Earlier this month, at their HCI Live event in Dallas, Texas, the HCI team introduced their new mobile coaching app, Coach Connect powered by MBODY360’s platform. 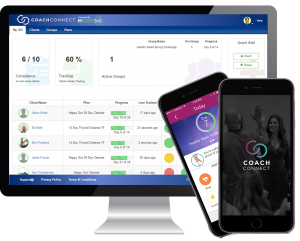 Coach Connect allows coaches to connect with their clients in friendly, convenient and creative new ways, The app is being made available to certified coaches by HCI and can be downloaded from iTunes and the Google Playstore. Coach Connect is preloaded with HCI’s plans including the 90-Day Total Transformation providing coaches with “done-for-you” programs, allowing them to focus on supporting their clients. Clients are provided all the information they need to successfully follow a program, along with the ability to track activities and progress and share their information with their coach. paving the way for coaches to work with clients offering customized support while monitoring progress. Innovation is a hallmark of Health Coach Institute’s success, with a world-class coaching education that has redefined what it means to be a Health Coach. Combining e-learning capabilities with the best instructors in the business makes it possible for coaches to drive real results for their clients and for their businesses, propelling entrepreneurs to build quality, sustainable businesses with meaning. The new mobile app is innovation coaches can use to save time and stay connected with their clients on the go – making getting healthy easier and more convenient than ever. Working with the team at Health Coach Institute over the last few months has been a fantastic collaboration, with so much creativity poured into their own special mobile experience, made powerful by MBODY360’s platform, with communications tools and tracking, including text messaging, video chat, and push notification. We are proud – and grateful – to be part of HCI’s thriving future and boundless, positive energy!